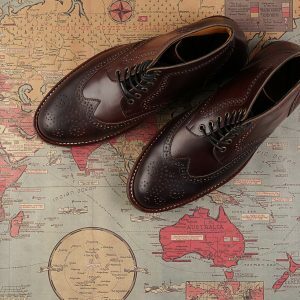 Was originally a brogue that made in Britain (Scotland and Ireland), where the worker used to work in the wet environment. But after time it is slowly changed as a decorative purpose for elegant looks. 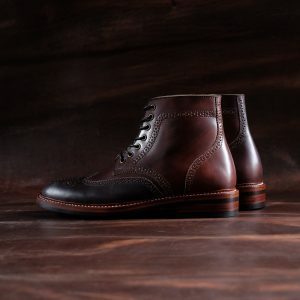 Our Wingtip Boots is a full brogue, featured pointed toe cap and the extensions that ends in the ball area. 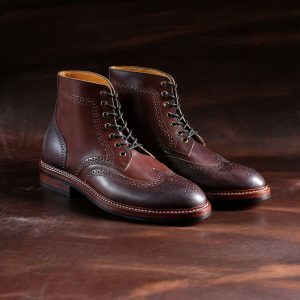 Do not forget the decorative medallion toe and brogue rounding the quarter area. It is surely will meet your elegant and rugged taste at the same time. 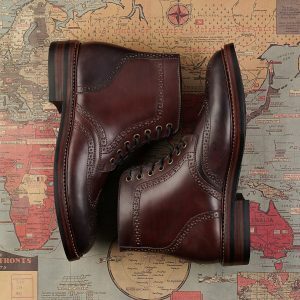 Linea d’ arte is our newest colour offering of shell cordovan. This unique colour is a creation from our skilled artisans, hence the name “art line”. The dye is derived from a patented blend of the finest Tuscan red wines. The colour is hand applied to each shell to achieve a rich, unparalleled finish.